Here’s the thing. You take your tablet PC to lunch with the intention of reading the latest on the RSS feeds. You open your news reader, you like an article, you want to share. One option is twitter. You try it, but the embedded web browser doesn’t know your twitter password. You open the article in the browser, and it doesn’t either. The app that does, the official twitter app, is not available as an option for tweeting. Compare this with the experience on a web browser. It remembers your twitter login details because there’s a cookie set. Sharing a link from Google Reader is simply a matter of pressing “tweet this”. Bang, it’s gone. Am I the only one who thinks that having multiple, separate web browsers, each with their own cookie stores (the App Model) as opposed to the single ubiquitous web browser with a single shared cookie store and unlimited available apps, is a retrograde step? Reminds me of the nightmare of cut-and-paste between applications on MS-DOS! Why can’t tablet PCs do this? Is Google Chrome OS (apparently just a browser as operating system) better? 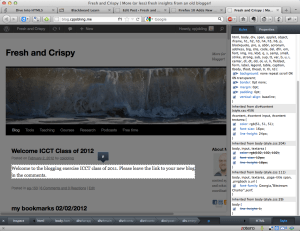 Welcome to the blogging exercise ICCT class of 2011. Please leave the link to your new blog in the comments. Mark Pilgrim wrote Dive Into Python (bookmarked elsewhere in this collection) and here he is writing an emerging O’Reilly Book called “HTML5: up and running” which will be released in a similar way … in paper with on-line version available under Creative Commons. It is now being maintained by the community. Chapter 1 of “Dive into HTML5″ the on-line version of Mark Pilgrim’s book that will eventually be published as HTML5: Up and Running by Google Press to be published by O’Reilly. I’ve linked this because it’s a very nice potted history of how HTML came to be.